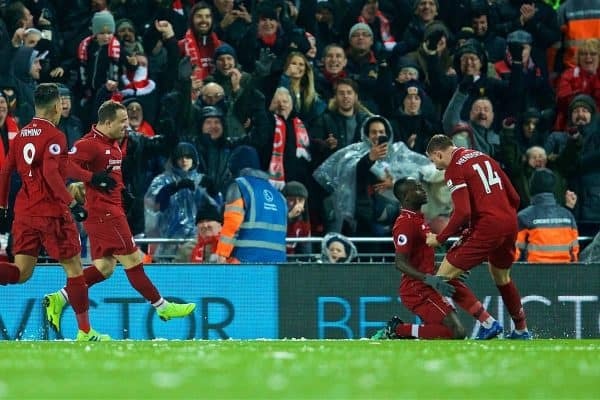 Liverpool scored early on Wednesday night but couldn’t hold on for the win against Leicester, although they stretched their lead at the top nonetheless. Goals: Mane 2′, Maguire 45′. Sadio Mane didn’t even give fans time to get nervous on the night, producing a fine early finish to put the Reds ahead early on. He was, in fairness, the Reds’ most inventive and aggressive attacker throughout — but that isn’t suggesting he was at his electric best either, as Liverpool were slow and predictable for too long. There was little space to operate in, but that didn’t matter a whole lot: no passes were attempted behind the Leicester back line, few midfielders committed themselves forward and it was an easier than expected evening for the Foxes. Even in the second half it was as though either the occasion, or the weather, was hampering Liverpool’s usual attacking play. Three subs didn’t push them forward and the half-sighters of goal weren’t enough to ever really suggest that a match-winner was coming. Right-back and—as ever—the centre of midfield were the two areas where Jurgen Klopp had decisions to make and his choices caused a fair amount of discussion even before kick-off. There might have been much talk surrounding Fabinho before the match, but it was centred around whether he’d be filling in on the side of the back line or at home in his favoured midfield role. Instead, it was neither: Jordan Henderson instilled at right-back, Naby Keita given the chance in the middle and Fabinho sub. In fairness to Henderson, he did relatively well other than one or two moments where he was caught positionally, but he worked the flank well and his passing was largely secure. The boss clearly wanted more from his side overall with their passing and his double sub came fairly early for Klopp—just after the hour mark—but the team didn’t appear to be set up to go all-out at any point. So, Keita got his chance in his main position. Did he take his chance? Not really. He had a few moments of neat approach play, some good footwork in the second half and one instance where he absolutely should have had a penalty awarded, but by and large he was too passive, too slow, too hesitant in possession. More than once, Keita was caught on the ball in the first half, unable to change direction quickly enough or play his pass with enough accuracy. 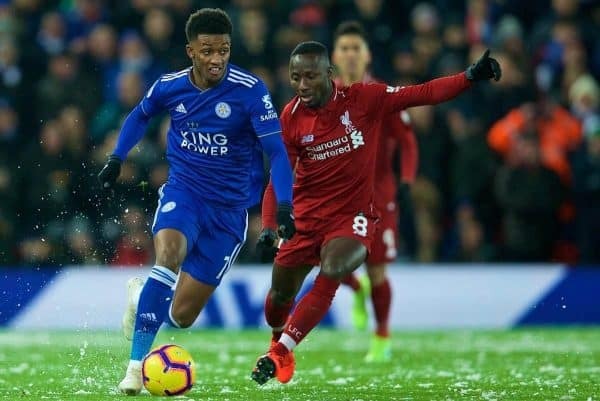 At times the massed ranks of Leicester shirts were almost begging for Keita to surge forward and run at them…instead, that task was often left to Joel Matip. Keita needs to do more, needs to show his best traits with a little more bravery. We await another sight of his very best form, but this was not it. For much of the season Liverpool’s defence has been the foundation of their title charge; over the past two games at Anfield, however, that has not been the case at all and mistakes have been apparent with alarming regularity. 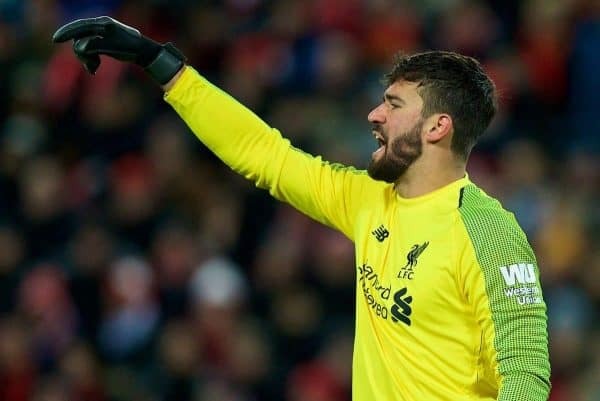 Alisson set the tone with a couple of errors early on in his passing, the second of which he was very lucky to escape with. Andy Robertson‘s needless foul and the subsequent inability of the back line to deal with the set-piece led to Leicester’s equaliser right before half time, while after the break there were more indecision and poor touches in the defensive third. 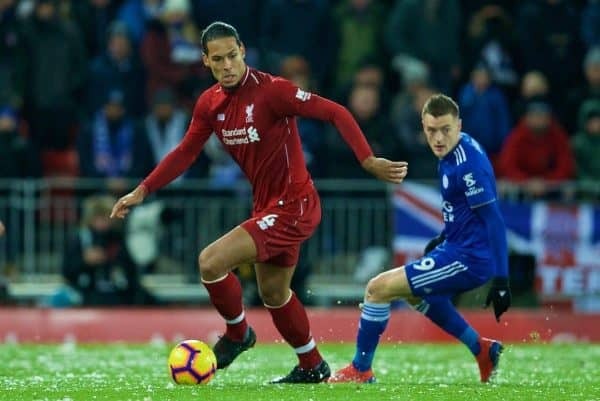 Injuries have, of course, played havoc with the defensive line in particular, while the conditions on the night made matters difficult against Leicester. But approaching a time of the season where every error could prove crucial, it’s hardly ideal that the defence seems to be struggling to hit top form at present. 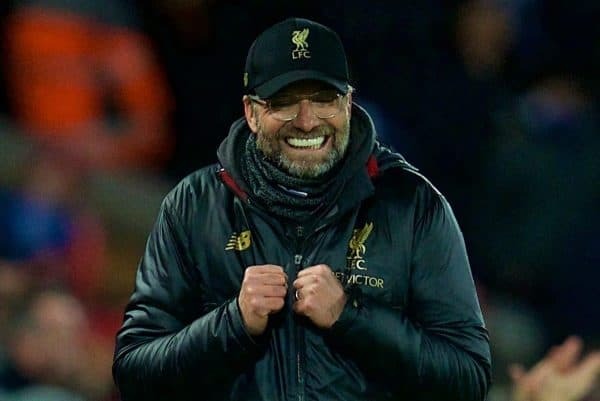 Strange as it might seem, this 1-1 draw actually takes Liverpool one step closer to their ultimate goal of the Premier League title. 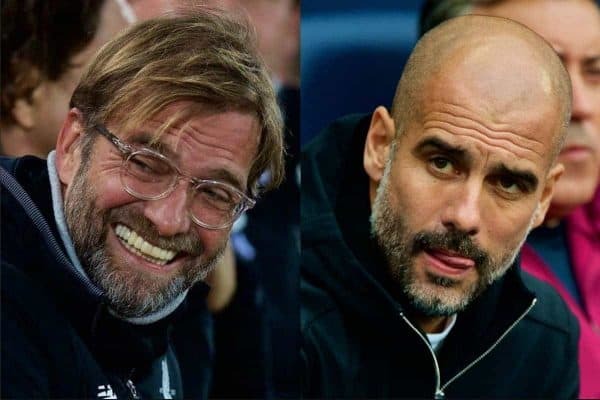 After Man City‘s defeat 24 hours earlier, the Reds have stretched their lead to five points, leaving City relying on two further teams at a minimum to inflict damage on the Reds—while winning all their own games. A result which could have gone either way—Keita’s penalty shout, James Maddison’s two-yard miss—but ends in a draw is only the first time this season that the Reds have dropped points to a team outside the top six. It had to happen some time, but the unbeaten Anfield run goes on and, most importantly, the gap at the top grows bigger. Next up it’s West Ham away and another game under floodlights and it shouldn’t be difficult for fans to view even this non-win as a positive step.